- In one word: support. QiPillow is far more than an ordinary pillow. It provides scientifically tested orthopedic back support for people of all shapes and sizes. - The QiPillow has been proven in a third party clinical study to help 91% of back pain sufferers relieve their back stiffness, pain and fatigue, and improve their sitting posture and comfort. - Like a Sleep Number bed, it uses an air controlled orthopedic core to provide the much needed dynamic and individualized support to your back. 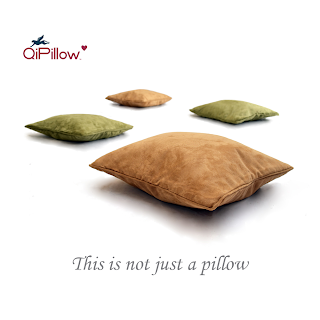 - Unlike ordinary pillows, QiPillow does not collapse under bodyweight and will help you to maintain the correct posture. - With QiPillow, your back support will always adjust to your body, seat and comfort, instead of the other way round. There is nothing quite like it in the world. 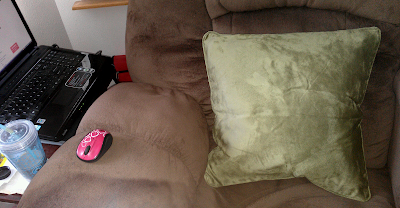 I use my QiPillow in my recliner and can't believe the difference it has made over the past couple of weeks. The comfort and support have been amazing! It's easy to make the QiPillow as soft as firm as needed, all it takes is a little air! I know that my dad would also benefit from one of these orthopedic pillows as well - ideally it would be great to have one for both the home and the car! On a different note... my daughter loves to use it as well. But of course her reasons are different than mine. She loves the sage green color (they are also available in camel) and the fact that it is super soft (mirco-suede) and warm on her face! Oh this looks so wonderful! I have had two back surgeries due to herniated discs. I will have to give this a try. I get so sore sitting!